It’s just 6mm long, which is one reason why it looks a bit weird, even for a grasshoppery-crickety thingy. I heard of these South African critters for the first time today via some brand new science, as reported in Ed Yong’s Not Exactly Rocket Science blog, and in Jerry Coyne’s Why Evolution is True. 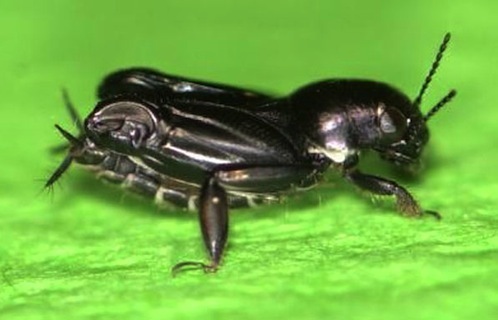 So what’s so cool about pygmy mole crickets? well, they can jump straight out of the water. Which, if you’ve ever seen a bee stuck in a swimming pool, is sort of cool. Check out the two blogs I linked to for more details. » Photos and video by Michael Burrows.